My Aspergers Child: The Gluten-free Casein-free Diet: Does It Really Work? The Gluten-free Casein-free Diet: Does It Really Work? The molecular structure of partially undigested proteins, called peptides, resembles opiates. These peptides have an effect much like opiates (i.e., morphine, heroin) in the brain and nervous system. Long-term exposure to these opiate peptides can have many damaging effects on the developing brain and also affects behavior, just as any narcotic would. The opioid peptides involved are identified as casomorphines from casein, and gluten exorphines and gliadorphin from gluten. Children with Aspergers and High Functioning Autism usually have gastrointestinal problems (e.g., reflux, constipation, diarrhea, vomiting, hiccups, etc.). Proteins found in wheat, rye, oats, barley and dairy products (gluten and casein) aren't completely broken down in the Aspergers child’s digestion process. These undigested proteins can leak into the bloodstream, potentially interfering with neurological processes by having an opiate-like effect upon their systems. These undigested proteins (peptides) can reach toxic levels, with the youngster seeming to "crave" milk and wheat products. With results like this, why would you NOT want to try it! A gluten-free, casein-free diet is definitely worth considering. You don't have to feel overwhelmed by the restrictive nature of the diet. Simply start slowly and eliminate one group (either gluten or casein) at a time. Once you're comfortable without wheat or dairy products, then you can tackle the next element. If you see a desirable result from eliminating one component, you may decide not to go any further. Simply substituting gluten-free flour in all recipes can be a highly effective action. Many parents worry about removing wheat and dairy because these foods are the only ones their child will eat, and because prevailing attitudes in Western culture consider them an essential staple. However, Aspergers children who eat mostly wheat and dairy products may show remarkable improvement once a gluten-free, casein-free diet is implemented. Many families have found from experience that their children's menu options actually increase after the effects of eating gluten and casein have subsided. A gluten-free, casein free diet usually has a detoxifying effect – not only on Aspergers children – but on the entire family. The benefits will be obvious. Some Aspergers children experience immediate improvement (although it may take as long as six months for gluten to clear out of the system - and one month for casein to clear). Advocates of the diet recommend trying it for at least a year, because it can take this long for some children to show improvement. The diet tends to make changes in the body at a cellular level and promote healing of the stomach and intestinal lining, both of which can take time. Sounds good on paper and exactly the right thing to do for the whole family. In practice my Aspies child has such a limited diet if I took out wheat and milk we would be left with sweets and crisps (chocolate being out too because of the milk!!). I'd be very grateful in hearing tips on how to broaden the tolerance of taste and texture so we can all go to a restaurant that doesn't have chicken dippers on the menu! Our son's diet has been free of gluten, casein, soy and eggs for several years. I do believe it has made an enormous difference for him. When other parents say it will be too hard, I always suggest that they not try to substitute everything their child has ever been fed. Since the breads on the market that contain no gluten, eggs and soy are truly horrible, I simply stopped making sandwiches for his school lunch. He took a thermos of mashed potatoes and beef, or a green salad with chicken, etc. instead. It's all in the mind-set. I have tried this several times and have seen no change in my daughter. However, I do believe diets do have a huge effect on our children. An alternative medicine clinic does food sensitivity testing (can't remember the name of the test) and it has been extremely effective for a friend of mine. Her daughter is not allergic or sensitive to dairy, but she is sensitive to wheat - not gluten. She can have glutenous rice, but nothing with wheat in it. She also is sensitive to chocolate, pork, basil, garlic, etc. The dramatic change in her behavior once these foods were eliminated from her diet was unmistakable. So, I think the huge advocates for the gluten/casein free diet just have kids that are sensitive to those foods. I really don't agree that all aspie's are. I do agree that finding what your child is sensitive to and eliminating it will make a huge difference for them - we just can't classify the offending foods in a nice "cookie cutter". We tried this diet, but didn't stick with it long enough. We started to see some results, but then got off track. I understand the article says to stay on the diet for AT LEAST one year. I think we did it for about 4 months or so. Will give it another shot. To Maggie: Type "picky eating" in the search box above for suggestions. Introducing the GFDF diet was the BEST decision we made! There are a lot of GF pastas and snacks on the market. We make our own GF bread. Watch out for 'hidden' gluten in items such as soy sauce, and commercial hot chips. My son also had the classic white/beige diet and he has adjusted very well. He even tries new foods now! A key to our success with the diet was the introduction of GFDF special snacks 'only' for my son. eg. sorbet instead of ice cream. So, it wasn't all negative and 'you can't have this'. A lot of kids can have butter (no milk, cream, cheese, yoghurt), this made it a bit easier for us. A word of warning, if you break the GFDF diet (even a little bit), there can be some real behavioural issues to deal with for quite a few days. Commit to it and give it a go...I think you'll be amazed at the difference. What I struggle with is the financial cost to this lifestyle change. We can barely afford to eat healthy foods without the added cost of buying gluten/casein free foods. Any suggestions for cutting costs?? What I have the hardest time with is the financial challenge this diet brings. With a family of 5, I have a hard enough time just trying to buy healthy foods, let alone specialty products! Any suggestions for affordable choices?? I'm seriously enjoying the theme/design of your blog. Do you ever run into any internet browser compatibility issues? A small number of my weblog audience have complained about my weblog not working correctly in Explorer but looks great in Firefox. Do you've got any ideas to aid fix this issue? I was wondering if anyone has their child on a low gluten diet? Gluten free will be very hard on my son, but I think if I can limit it, that we will still see results. We have not had him tested yet for food allergies but plan to do so. Right now, we are dye/preservative free for the most part. We found that our son had to be 100% Gluten and Casein Free to notice any improvement. But that was just our experience. Haven't posted for a while, the way it was described to me was our children cannot break down the proteins and they form a type of "opiate like" substance, which gives them a bit of a hit, which is why they keep wanting the same things like cheese, pasta, yoghurts etc. I tried my son on the glutine casien free, he changed, he was much more interactive, talked to people without being constantly prompted and talked about what they asked rather than just banging on about what he was focused on. The only problem was we replaced the milk with soya milk and his eczema kicked off big style, once I get him skin under control I will try again. Its worth a shot, just make sure you replace the calcium as apparently autistic kids have less dence bones than nt kids. I am starting the GFCF diet for my daughter and am wondering if someone can give some tips for brands/or things that you have found as substitutions for gluten ie:bread,waffles,pastas, or snacks. My daughter is a picky eater and has her routine of foods that she eats, like oatmeal, waffles, pb and j sandwiches, pizza, mac n cheese. This is a subject that has confused me for many years. My son had a blood test which shows that he is intolerent to wheat, oat,cows milk,yeast,chili pepper,gluten and egg white. However i have heard that only allergies can be proved though a blood test not intolerences. Does anybody else know any more about this? My son does not have tummy or bowel problems, headaches, bloating or nausea or any other physical symptom for that matter so, could he still be intolerant to certain foods? Are there other symptoms that could indicate intolerance? We tried him on a diet for 2 weeks but saw no change and it was proving to be difficult to maintain so we gave up. Should i have stuck with it for longer to see results? I must say my son loves his food and will try anything so we really need to be sure if we are to try again as he loves to eat! All I can say is when I cut out dairy and gluten my thinking is much clearer. Tonight I gave in to nachos and I am now in a casomorphine stupor. HELP! I want to go GF with my Aspie son, but I am afraid to commit to it. 1. It is so expensive and we have trouble with buying food for the family normally. 2. My son eats specific foods. Of course many parents with Aspies will identify. He loves certain foods and will not deviate from them because he has texture issues. Please give me ideas on how I can do this completely. I want to help him!!!!!! we started with the gluten free diet almost a year ago for my 7 year old son and the changes have been amazing. The results started showing as fast as 1 week. He's calmer, he can focuss more and he sleeps much better. We don't live in the US so the options of gluten free products is very limited and is very expensive. I think this process is a try/fail process, some of the products he hates and others are a great hit. I recommend buying a cooking book so you can prepare your own foods instead of purchasing pre-made (cuts down the cost). In our case, if for one meal he doesn't follow the diet this isn't a big deal, we just go back on track for the next one. Give it a try, it's worth it. We went almost cold turkey to gfcf. I simply replaced the bread with gluten free one, got gf noodles and soy yoghurt, almond milk, rice milk etc etc. LOs diet is still pretty predictable, he 's not very anxious about trying new foods but by replacing foods he knew with same looking gfcf foods it went very smoothly. We've started about 2 weeks ago and he seems to have made some progress. One thing to be wary of going on GFCF diet, is that "replacement" foods (that just use alternative flours and more sugar) can also prove problematic for diet sensitive children. We went off gluten over six months ago, and I did the typical, "well, I can't buy wheat flour bread, I'll buy rice flour or tapioca flour bread, same thing with cookies, snacks, cereal etc. " (I am GF as well). And I have been learning, processed food is really the problem, not just gluetn and casien. If you have tried GFCF and haven't seen good results, this is probably why. We don't know that the processing techniques of "gluten free" food is any healthier than non-gluten free, and much of the products out there are so new, and it is likely to be just as unhealthy as wheat gluten. The way wheat gluten BECAME super bad for us was all the extensive processing it has undergone over the years. The REAL ANSWER is eating more REAL FOOD. More vegetables, more fruit, more vegetables, a little bit of organic meat, more vegetables. And the PRICE of all the "expensive" healthy food is really in the PROCESSED organic food. When our grocery list became mostly produce, it was NOT more expensive. We have an aspergers son (10) and I feel the pain of everyone who asked about HOW to CHANGE diet, when the smallest change equals a HUGE amount of misery. We have tried every possible technique. The secret is gradual, yes, but it is also that the child's body gradually feels better and this is your best ally. You have to be tough and creative and flexible and determined and be ok with feeling a little bit crazy all the time. For years. Ha ha. But I am posting this (6 mos. after this thread was updated last!) to say, don't give up! 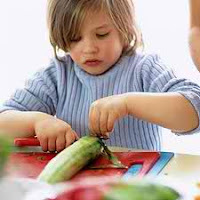 Be dedicated to the optimum health of your child and don't settle for a diet that truly harms your children's health. It is WORTH it. The average diet of our culture is horrible for all of us, not just our special needs children. We also have not really found a fabulous bread alternative, but we found a decent pizza alternative and whilst baking bread proved to be a disaster, cookies went well and the evening meal stuff is easy enough with rice, potato, meats, fish etc, our big sticking point is bread, my son loves cereals and those are plentiful for gluten free here in Germany, I just mix my own to make it more interesting. I notice a difference but having the support of your spouse is essential. I know I was worried about how much gluten free and other special foods cost. You have to also look at it in a different light. If you don't do the special diets, you probably would have to spend maybe more on meds to help "calm" the intolerance or allergy that causes the problems. As my mom put it to me about the prices my brother has to pay, she said that the special foods he eats are considered as his "medications". I know insurance doesn't cover food items, but sometimes insurance leaves a pretty high deductible for you to pay on meds. My 1 year old daughter has not been diagnosed with anything yet, but was delayed in her motor skills particularly crawling. I had cut out dairy due to a sinus infection bc I read it was mucus building. 24 hours after I stopped the dairy formula she started to crawl. Not a slow or 3 legged crawl but a fast, immediate crawl. I was in shock. It had such an immediate effect. The doctor told me to immediately cut out any dairy. I'm waiting to see next week if he tells me to cut out gluten.